Posted November 28, 2017, in Seminars. Lawnside, New Jersey, is a unique community because it is the only self-governing African American Borough in the State of New Jersey. This talk will first examine the early history of Lawnside and the regional, state, and federal political processes which impacted its growth and development. The second section will be an analysis of how Lawnside youth developed their own Black Power organization known as the Young Blacks who actively worked to improve the governance of the community and stressed the principles of non-violence and educational advancement. The third section of the talk will be an analysis of African American student activism at Haddon Heights High School. Jason Romisher’s research employs a wide array of primary sources that reveal how the Black Liberation Movement played out in an autonomous African American community. Jason Romisher is a MA candidate in History at Simon Fraser University. He holds an Honors Bachelor of Arts Degree from Queen’s University and a Bachelor of Education Degree from Lakehead University. Jason has fifteen years of experience teaching high school history and coaching football. He spent the summer of 2016 doing extensive historical research in the South Jersey area as part of his MA thesis. Jason’s main research interest is race-relations and education in the American north, particularly the South Jersey area. His non-academic interests include: birding, photography, backcountry hiking, and athletics. ‹ Previous: CURE-affiliated scholar Dr. Lori Minnite in the news! Page last updated by CURE at 2:44 pm January 9, 2018 . 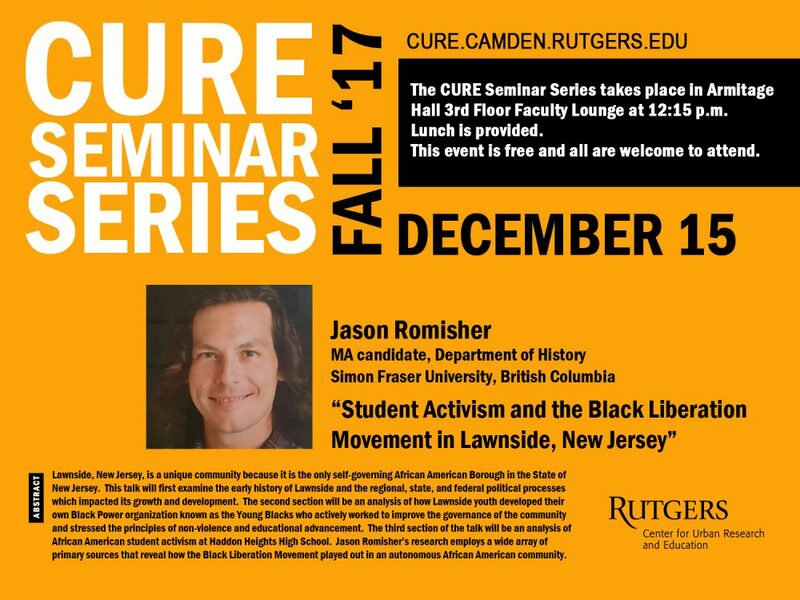 This page was printed from http://cure.camden.rutgers.edu/2017/11/28/cure-seminar-series-student-activism-and-the-black-liberation-movement-in-lawnside-new-jersey-with-jason-romisher/ at 8:30 AM Saturday, April 20, 2019.